Chia Seed Gel is Super Easy to Make. Just Add Water! Chia seeds contain more Omega-3 fatty acids than salmon! more calcium per ounce than milk, and more protein than any plant-based food, including soy. No wonder everyone is excited about this little known power packed nut, and yes birds eat them, probably have been for 1000’s of years. Apparently Chia seeds are also great for horses! Fantastic source of vitamins for creatures great and small. From the lowly bushtit to a large muscular horse, these little seeds are powerful good. Whether you’re feeding humans, birds, or horses, get the best. Don’t feed them pesticides, those low quality seeds are also far less nutritious. These are the best chia seeds to buy for birds, horses and people as well. Whether they are bipeds or quadrupeds or winged, get only the best quality chia seeds for your loved ones. Turns out, chia is hydrophilic (means: water loving) and can absorb up to 10 times it’s weight. Frequently used for weight loss by making you feel full, there are many uses, in this article I hope to present more as I discover them as well as my picks for the best organic chia seeds. I’m a big believer in going organic for a long list of health reasons, but also for a long list of political and economic reasons. I’m limiting my focus to health here at this blog, but there are certainly very compelling reasons for a society to grow organically instead of spraying with atrocious pesticides you wouldn’t want any where near your home. If they were spraying that stuff in your back yard, you’d probably get very sick. Here at HealthyCreatures, we prefer healthy creatures and we aim to help the sick creatures, starting with their diet. Salvia Hispanica, known as Chia, is a species of flowering plant in the mint family and is native to southern Mexico and Guatemala. Do birds eat chia seeds? Absolutely, in southern Mexico they have very healthy birds I suspect. Turns out, these tiny black seeds are loaded with antioxidants which inhibit free radical production. In addition, chia seeds are 40% fiber. Eating more fiber can help you feel more full and aid in digestion. 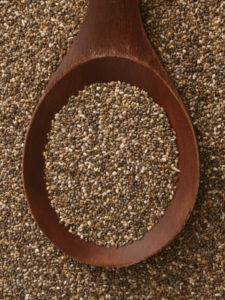 Chia seeds also contain a high level of protein from a vegetable source. Fiber and protein combined can help to aid in weight loss, adding to the list of benefits from this superfood. A study where patients were given chia seed showed lowered blood pressure and improvements with type 2 diabetes. Simply Add a heaping tablespoon of chia seeds to a glass of water and wait a half hour to an hour. You can stir it periodically while it expands dramatically before your eyes. That freshly SPROUTING nutrition is powerful healing indeed. When you add water to Chia seeds, this superfood will puff up to many times it’s size and becomes this amazing Chia Seed Gel. THe nutritional benefits are greatly amplified. Like all seeds, they get puffy when soaked in water as they are coming to life, or ‘activated’ in other words they are beginning to SPROUT really. And yes, they are far more nutrition after they have been soaked because there are more living enzymes present. The health benefits of ALL nuts are significantly increased when they are soaked in good clean water and best of all, it’s really really easy. Just mix a table spoon of seeds with a cup of water and watch them expand like magic and “drink” up the water! I tell the kids they are MAGIC SEEDS, which is not far from the truth really. This kind of nutrition is very magical for both humans and birds, we need this stuff and who can afford expensive vitamins which are synthetic and usually made with coal tar. Skip the vitamins and eat the whole foods. The right whole foods. The best whole foods. It’s just as simple as that. Very educational video on Chia seeds. He really presents some fascinating facts and has done his research. 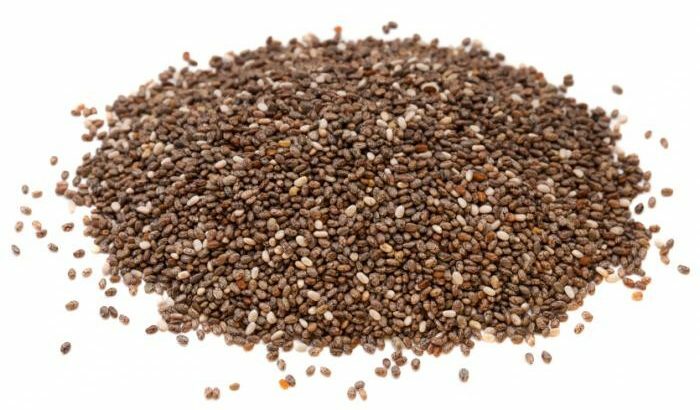 Chia seeds and chia seed gel are virtually unknown foods to most people in the western world, but this is truly a fantastic superfood with numerous remarkable health benefits. I like taking a teaspoon dry for an upset stomach, that’s a hot tip right there, especially for those who are lactose intolerant. For humans, there are NO side effects from eating Chia seeds that I have ever heard of. Period. Birds eat these things, people eat them, billions of them are growing as we speak and nobody get’s hurt by any of it. No toxic man made chemicals or additives. Just seeds. Very tiny, filling and surprisingly power packed seeds. I don’t think there are any side effects, these are an ancient time tested pure and safe FOOD. Food doesn’t have side effects unless you’re allergic. If you’re allergic to something, of course, don’t eat it! You’re not going to see a long list of possible side effects listed on the package with a simple ancient food like this, it would be silly. These tiny seeds are cool, you get about a BILLION of them in the bag, but I haven’t actually counted. Don’t let their tiny size fool you, they are packed with nutrients. Extremely healthy with many interesting benefits. This is one superfood with a colorful history in the ancient world. Native american long distance messengers in Mexico would bring a sack of chia seeds which would sustain them and keep them well hydrated for the long trip. You can live on these in a pinch in other words. Chia Seed Gel is super easy to make, just add water! You probably get millions of them in every bag but I’ve never counted. I would love for somebody to actually count how many are in a pound. I’d be curious to know but it might take you a while to count them! Get a comfortable chair and a magnifying glass! I highly recommend Chia Seeds to anyone that is not allergic, although I’ve never heard of this being a common allergy at all. If you’re allergic to NUTS of course, you will want to consult with your doctor before trying chia seeds, I’m really not here to advise you in these matters, just talking about nuts and how I love them. Here are my top picks below. Remember. For the humans out there..Always soak nuts in water before eating them. All types of nuts. They begin to SPROUT unless they are dead nuts. 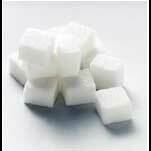 Just soak em for a few hours and the nutritional content is hundreds of times greater in some cases. Almonds, walnuts, any type of RAW UNPASTEURIZED nut. Soak it. Get in the habit. Thank me later. They also taste MUCH better after soaking. They get puffy and flavorful, bursting with live enzymes I think. I don’t think this is advisable for animals however. If you can get your bird to eat soaked mushy nuts, more power to ya! Certainly would be healthier for all animals, but I don’t think it will go over very well because birds like crunchy nuts I’m told. I would love to hear your stories, if anyone is able to soak the nuts for a few hours before feeding your animal successfully please do let me know about it. I’d say for birds, leave those seeds crunchy, but birds are like people with unique personalities, some birds might love them soaked! For me, they do have more flavor after soaking and certainly they are healthier when “sprouting” in water (or starting to sprout). I generally soak my chia seeds for an hour or two. It’s definitely a matter of personal taste though, some might soak them way longer and even store the gel in the fridge but I don’t recommend it. Soak em for a few hours, and eat em. Eat em while they’re sprouting, or think they’re sprouting. When they get some water they just explode with nutrition and flavor. All (living) nuts will do this. Be sure your nuts are not pasteurized (or “heat treated”), even some “raw” seeds are actually NOT raw in fact. Know your nuts! Consult with your bird or horse if you’re uncertain, they will let you know how they prefer their food. These three are great deals on chia seeds, and very high quality. Also great for horses! Who knew!! If you’re looking for cheap non-organic seeds, or something very healthy to feed the old MULE or HORSE (who knows right? ), here’s some non-organic options for HORSES, but I bet a human could live on these no problem if they wanted to save money and live healthy. I wouldn’t eat it, these are for HORSES, but whatever. I seriously doubt it would hurt ya. Some more deals, in bulk. For HORSES. The second row is NOT organic to my knowledge and is for HORSES. That one deal says “equine” so your horse knows it’s ok to eat. As you may know, some horses CAN read so they had to put that on there to re-assure the more literate steeds in the herd. For non-believers, just watch “Mr. Ed” the 1950’s tv show for proof!